Interests:Ready to get back to normal...and a reef tank! So I'm planning on building a stand for a 90g tank this weekend. I found some great videos on YouTube, but I thought I would ask the community about any tips you guys might have. You Tubpretty much covers te basics for a reliable stand. Now if you want to take it to the next level that is another. Location, Deco, How tall. Where willyou be viewing it from. If you want it fancy check out SALTLIFE. It would also help if you complete your profile to give us an idea of your location . This way we can tell who is local. Dc reefer - I literally just signed up so I'll fill out my profile tonight (I can't figure out how to do it on my phone). I'm in the Nationals Stadium area in DC. I'm in an apt building. The tank will be up against a wall on 2 sides. I don't have the dimensions here on me, but the tank itself is a standard 90g. I'm not trying to do anything fancy. I just want a good basic stand. I read that using 2x6 are much better than 2x4. I also figured on using a waterproof agent to the ply wood board. 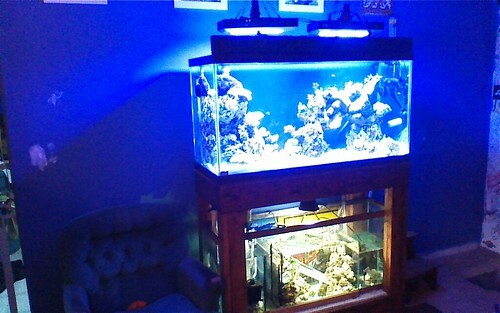 google rocketengineer and reef central or google DIY stand on reefcentral, there is a great DIY stand template. used it for my 90g back when....actually if you want a stand let me know i need to put that thing up for sale at some point. only real suggestions are to make sure the floor is level first. or build the base of the stand on the floor so its level with the floor then adjust the top bracing to be level if you dont want to use shims at all. I built my stand for my 90 using all 2x4's which is more then enough strength to hold a 90. I documented a lot in my build thread here on the forums. Don't worry it is very easy. - make sure it is level as possible! This will be your hardest task! - waterproofing is def. a smart choice! - make good ventilation holes!!! I did the rocket engineer stand on my 93 cube using all 2x4's it's very stable, and I'm happy with it. I had Saltlife build my doors and he did a great job for a very reasonable price. also take not he managed to wedge his 55 under there, also another advantage to DIY over buying a stand, do I sound bitter? I assure you i'm not at all lol. You did seem to like like my build, huh?? Lol. Nothing wrong with building your own stand, but you might wanna check out the Marineland Monterey stands. They are much taller and nicer than typical stands. I got one of them, and then built a base under it to vent an HVAC receiver. Stupid in floor HVAC outlets. I ended up buying a stand from another member. Saved me the follies of trying to make it even and relying on HomeD for accurate cuts!